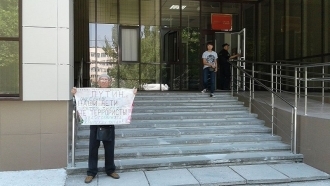 At the time of detention, the activist was standing near the courthouse with a placard with inscription in big letters saying "Putin, our children are not terrorists!" 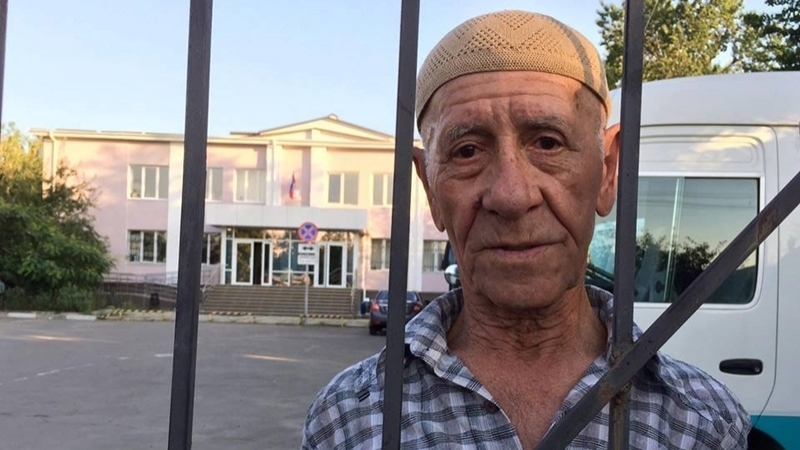 August 9, Crimean activist Server Karametov, who went to a single picket in support of the Deputy Chairman of the Mejlis Akhtem Chyigoz on August 8, was sentenced to 10 days of arrest by the "court" in the Crimea for allegedly "disobedience to the police." Activist Zair Smedlyaev reported the developments on his Facebook page. Lawyers Emil Kurbedinov and Edem Semedlyaev were not allowed to join their client Server Karametov during the trial, Kurbedinov reported himself during a live broadcast outside the court building, made by a public activist Ayshe Umerova. “They did not allow us to the announcement of the judgement. We are his defenders. We arrived at the announcement of the court decision. This is lawlessness, since with the end of the court hours the publicity of the court does not end. This is a violation of the law," Kurbedinov said. In turn, another lawyer Lili Gemendzhi, who attended the court session, provided some details on the protocol. "We interrogated the police officers, one of them, Olesya Kryvchuk, admitted that she made changes in the protocol after she had handed it to Karametov. Furthermore, the police officers could not figure out if the detention actually took place, and confessed that they made mistakes in the protocol. We could not work out why the protocol had not been drawn up at the crime scene. We had many questions to the officer, who explained to Karametov that he was committing an offense. This all gives grounds for closing the administrative case," Gemendzhi said. It should be noted that Server Karamets suffers Parkinson's disease and a speech impediment, however, the Russian security forces detained him, and kept in court for two days. On August 8, the Railway District Court of Simferopol fined the elderly activist 10,000 Rubles.